From the 1700's through the early 1900's, wood was combusted in the United States to produce ash for chemical extraction. The ash was mainly used to produce potash for fertilizer and alkali for industry. As other potash production technologies became more economical the value of wood ash as a raw material dropped. Recently, ash has been considered a waste product instead of a resource as few industries have taken advantage of the beneficial properties of the ash. Today, approximately three million tons of wood ash are produced annually in the United States. While approximately 80% of all ash is land applied in the Northeast United States, less than 10% is being land applied in the Southeast. The other 90% of this wood ash is currently being landfilled. While several alternative uses for wood ash have been developed, land application is one of the best methods for ash utilization as nutrients taken from the land during harvest are recycled back to the land. In a survey of more than 80 Southeastern paper mills, 60% of the responding mills reported an interest in land application. Wood ash has the potential to be used as a lime substitute in almost all Georgia's counties." Wood ash is the inorganic and organic residue remaining after the combustion of wood or unbleached wood fiber. The physical and chemical properties of wood ash vary significantly depending on many factors. Hardwoods usually produce more ash than softwoods and the bark and leaves generally produce more ash than the inner woody parts of the tree. On the average, the burning of wood results in about 6-10% ashes. When ash is produced in industrial combustion systems, the temperature of combustion, cleanliness of the fuel wood, the collection location, and the process can also have profound effects on the nature of the ash material. Therefore, wood ash composition can be highly variable depending on geographical location and industrial processes. This makes testing the ash extremely important. Ash is composed of many major and minor elements needed by the tree for plant growth (Table 1). Since most of these elements are extracted from the soil and atmosphere during the tree's growth cycle, they are elements that are common in our environment and are also essential elements in the production of crops and forages. Calcium is the most abundant element in wood ash and gives the ash properties that are similar to agricultural lime. Ash is also a good source of potassium, phosphorus, magnesium, and aluminum. In terms of commercial fertilizer, average wood ash would probably be about 0-1-3 (N-P-K). In addition to these macronutrients, wood ash is also a good source of many micronutrients that are needed in trace amounts for adequate plant growth. Wood ash contains few elements that pose environmental problems. Heavy metal concentrations are typically low and not in a highly extractable or available form. Field and greenhouse research have confirmed the safety and practicality of recycling wood ash on agricultural lands. It has shown that wood ash has a liming effect of between 8 and 90% of the total neutralizing power of lime and can increase plant growth up to 45% over traditional limestone. The major constraints to land application of wood ash are transportation costs, low fertilizer analysis, and handling constraints. With ever increasing disposal costs, land application of wood ash will probably be the disposal method of choice in the coming century resulting in savings for the industry, an opportunity for agriculture, and conservation of our resources. Georgia's regulations concerning wood ash application are rather vague and difficult to follow. Wood ash is specifically exempted from the Georgia Department of Agriculture's fertilizer act and does not meet the specifications outlined in the regulations that govern agricultural lime distribution. Depending on the interpretation, it could be registered under the Soil Amendment Act, however, the Department of Agriculture has not registered it in the past. To facilitate the distribution of wood ash, a recommended procedure for the land application of wood ash has been established and approved by the Georgia Department of Agriculture and Environmental Protection Division of the Georgia Department of Natural Resources. Basically, these recommendations state that the wood ash supplier should meet certain requirements that insure that the wood ash composition is safe for the environment. To distribute wood ash to landowners, the supplier will likely require the landowner to show that proper soil tests and analysis have been performed to calculate the optimum application rate. In addition, the supplier will probably maintain records on the distribution of the wood ash and ask the landowner to sign a release form. The landowner is responsible for obtaining soil test and calculating the appropriate application rate, however, these services may be provided through the Extension Service or other qualified individuals. Most of Georgia's soils are naturally infertile, acidic, and low in organic matter. Therefore, continuous agriculture requires many soil additions to correct for these deficiencies. The fact that additions such as nitrogen often lower the soil pH makes the addition of neutralizing agents such as lime or wood ash a necessity on most Georgia soils. Liming improves crop growth by decreasing the availability of certain metals below toxic levels, providing Ca and Mg to crops, and improving P availability. While dolomitic and some calcitic limes are the most common additions used in Georgia, wood ash has many of the same effects as commercial lime. It also has the added benefit of being able to replace many of the macro and micro nutrients removed during plant growth and harvesting. Several studies have compared plant growth using both traditional limestone and wood ash and most have concluded that ash gives better growth responses than limestone. While some studies have reported detrimental effects at extremely high application rates, these responses were explained by the drastic increases in soil pH beyond the plant¹s optimal level. As long as the soil pH is maintained at the proper level, productivity will be enhanced by using wood ash as a liming agent and soil amendment. Planning for wood ash application requires several considerations. Before planting any crop the soil's nutrient level and pH must be determined through proper soil testing. Landowners should consult with their local Extension office or soil testing laboratory to obtain a bulletin outlining the proper procedures for soil sampling and determining proper liming rates, however, several of the essentials are reviewed here. Samples should be taken in the fall or winter. If fields contain variable soils, they should be divided into blocks with similar characteristics and sampled individually. It is also important to obtain a representative sample. This can be accomplished by mixing several cores from a variety of locations within each sampling area. Not only will this enhance crop uniformity and production, but could reduce the input expenses as well. Maintaining accurate records is an important aspect of soil testing. A collection of past records can be used to identify the buildup or decline of any chemical component in the soil profile so that changes in the inputs can be made. For example, if two tons of lime are needed per acre and the ash has a CCE of 50%, then four tons of ash would be required. While this calculation is relatively easy to make, it is strongly recommended that producers allow the county extension agent or other qualified individuals to calculate appropriate application rates. At times, fertilizer application rates may also need to be reduced when liming with wood ash as the ash may contain significant amounts of plant nutrients. Therefore, if additional fertilizer applications are being used, they should be formulated to insure that the plant requirements for these elements are not being exceeded, especially on crops that are known to be sensitive to particular nutrients such as phosphorus and potassium. During application of wood ash to the soil, special care should be taken to prevent the ash from entering any surface or ground water. A distance of at least 50 feet should separate the wood ash from any farm ditches, wells, or other bodies of water. This distance should be increased to 100 feet in highly erodible areas or areas without riparian stream side vegetation or buffer zones. Karst areas in Georgia present unique conditions where surface waters can rapidly reach the groundwater with little attenuation of pollutants. In these areas, or within wellhead protection areas where local ordinances may impose additional restrictions, application rates should be reduced or larger buffer zones should be used. Wood ash should not be applied to areas with water standing on the soil surface. Care should also be taken to avoid wood ash applications immediately preceding periods of prolonged rainfall or when large storms are expected. Wood ash should be land applied as soon as possible to avoid the need for on-site storage. 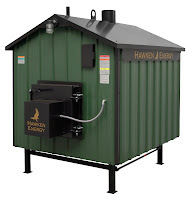 When conditions such as inclement weather do require on-site storage, wood ash should be stored in a manner that prevents runoff particulate from entering surface or ground water. Indoor storage is ideal; however, when it must be stored outdoors it should be placed on packed soil or pad surrounded by a small berm to prevent surface water from entering or leaving the storage area. The storage area should also be located away from wells, surface water, and animal watering areas and covered or shielded as much as possible to prevent nuisance conditions if it were moved or disturbed during dry or windy weather. One of the major obstacles to land spreading of wood ash is the undesirable handling and spreading characteristics of ash. Most ash has a low density and small particle size and consequently creates dust problems during transport and application. Wood ash should always be covered during transport to prevent losses in route to the application sites. Studies indicate that the handling characteristics of ash generally improve with increasing relative humidity so attempts should be made to avoid spreading on extremely dry days. Moisture can be added to improve the handling characteristics of ash, however, if too much moisture is added the ash will cake and become difficult to spread uniformly. Ash can be spread with conventional manure spreading or lime application equipment and is either top dressed or incorporated. To get the maximum benefit, incorporate the wood ash throughout the root zone whenever possible as the benefits only occur where the ash and soil are in contact. It is also essential to calibrate the spreader to insure that the target application rate is met. Due to the physical characteristics of ash, it is often difficult to obtain uniform application, but calibration and knowledge of the application distribution of the spreader can help to minimize non-uniformity. The fall is generally the best time for wood ash application. Soil pH is generally lower in the fall and applications at this time will allow the ash will have plenty of time to react with the soil before rapid spring growth. Soils are also usually drier and more accessible in the fall. Application at other times throughout the year is acceptable; however, ash should not be applied immediately preceding planting or during early emergence as it could cause short term concentrated alkaline conditions that could interfere with plant growth. Ash may also absorb pesticides if it not given time to neutralize in the soil, so chemical applications should be avoided for three to five days prior to or after wood ash application. Health considerations must be taken into account when dealing with ash to prevent both particle inhalation and contact with the skin. Inhaling any small particle is dangerous so masks should be worn during application or when dusty conditions warrant them. Ash is an alkaline material with a pH ranging from 9-13. Therefore, this material could irritate the skin. To prevent this, skin should be covered during application and transport and skin areas exposed to ash should be washed and thoroughly rinsed with water immediately following application. It is also important to remember that fresh ash can still retain hot coals which are both a health risk and a fire hazard. In summary, wood ash application is similar to lime application. Both materials can benefit crop productivity but wood ash has an added advantage of supplying additional nutrients. Both materials are also alkaline and could cause crop damage if over applied or misused. It is imperative that the land owners follow the prescribed application rates and use common sense approaches to prevent accidents and avoid environmental contamination. wood ash samples and ground limestone.